Paul Dunne is four shots off the pace going into the final round of the ISPS Handa Vic Open in Australia. The Greystones golfer stands at 11 under after a carding a 70 in what were testing third-day conditions at the 13th Beach Golf club. His round included four birdies and two bogeys to leave him in joint-seventh place, with Wade Ormsby leading the field by two shots. Of the other Irish, Gavin Moynihan and Michael Hoey are on seven under after rounds of 70 and 75 respectively. Aussie Ormsby who claimed his maiden title at the 264th time of asking at last season's Hong Kong Open, surrendered a double-bogey when he found a terrible lie on the par-five second. 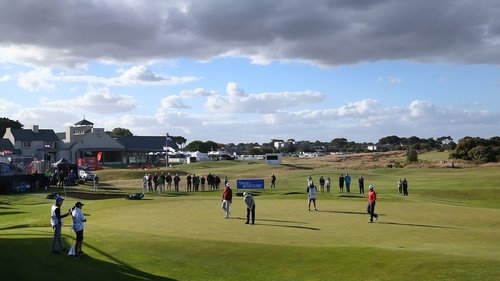 But birdies at the fifth, ninth, 13th and 18th gave the 38-year-old from Adelaide some breathing space heading into the final round on 15 under. Fellow Australian Matthew Stieger, who recorded the round of the day with a 65, and Callum Shinkwin are tied for second - the Englishman having signed for a 66. Challenge Tour graduate David Law, South African Justin Harding and Australia's Brad Kennedy are three shots behind Ormsby. Overnight leader Jason Scrivener struggled with a 76 to tumble down the leaderboard and into tenth spot. In the women's event, American leader Kim Kaufman had a late stumble to card a 75. Kaufman takes a two-shot lead into the final round over France's Celine Boutier, who matched the lowest round of the day with a 69, and home favourite Su Oh.